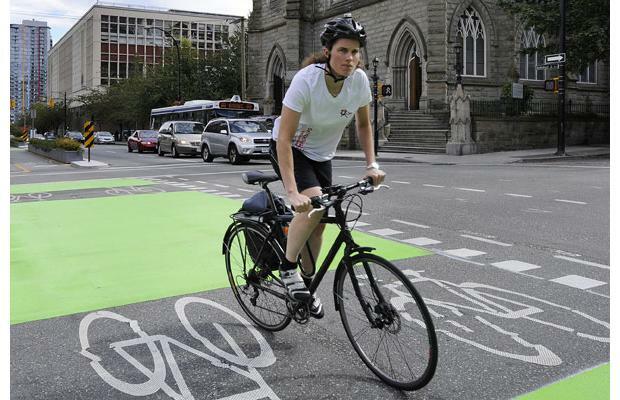 The creation of separated cycling lanes in Vancouver's central business district are not only the talk of the town locally, but have been noted elsewhere, with praise. "Just last week one of my colleagues based in New York told me that Vancouver has a great reputation as a place for creative, fresh thinking. He thought it was a benefit in our marketing positioning that we come from here." says Jason Mogus of Communicopia, a local communications and digital design agency serving a global client base. "I was proud to hear that, as Vancouver is not usually even on the radar of a big center like NY. Those are exactly the kinds of things that this city needs to become more known for: innovative ideas, real solutions, and leadership on the biggest global issues of our times. Having dedicated bike lanes - some of the first in North America, helps prove the point that Vancouver is a global leader, worthy of being listened to." Leadership is what will get us to long term sustainability, in terms of our economy, environment, and general quality of life. There is a limited amount of space left downtown, and encouraging the continuation of car travel is no solution. Congestion is a real threat to commerce, and we can see cities all over the world finding solutions. London has introduced a congestion cordon around its downtown and built cycling superhighways that bring bikers in safely from the suburbs and relieves roads from traffic jams. New York has opened up streets to pedestrians and cyclists and it has improved the car congestion issues near Broadway and Fifth Avenue. It has also greatly improved safety. Injuries to motorists and passengers in the project area are down 63% and pedestrian injuries are down 35%. Mogus isn't alone in his appreciation of the downtown bike lanes. In fact, nearly 100 businesses have joined Business for Bikes to support the cycling improvements they say benefit their bottom line and make the region a better place to do business. Mathieson McRae, of Vancouver business Frogbox, appreciates the safety improvements and the feeling of comfort it gives his drivers. "As a delivery-based business serving the downtown core, we're happy to see infrastructure that allows for our relatively large trucks to safely share the streets with a greater number of cyclists." McRae notes that "Cycling provides a healthy, low impact mode of transport to and from work for 75% of our employees. More people cycling will mean less automobile traffic so our delivery trucks would spend less time on the road." Ensuring a thriving downtown economy depends on having the effective movement of goods and people. Vancouver is quickly going to move beyond the capacity to accommodate this growth with automobiles. Cycling is a low footprint, fast, and accessible form of transportation that has the potential to improve the efficiency of road space and simultaneously make the downtown core a nicer place to be. Both of those results are good for business, good for residents, and, it turns out, good for our reputation. The Vancouver Area Cycling Coalition (VACC) is a non-profit society whose members work to improve conditions for cycling in Metro Vancouver. The VACC promotes safe and respectful cycling for everyone through advocacy, education and events. For more information, please go to www.vacc.bc.ca.